Several GOV.UK makers have given the team advice, covering everything from department directory data to the entire GOV.UK scope (well done Ross Ferguson and Lisa Scott for summarising this in a couple of paragraphs!). 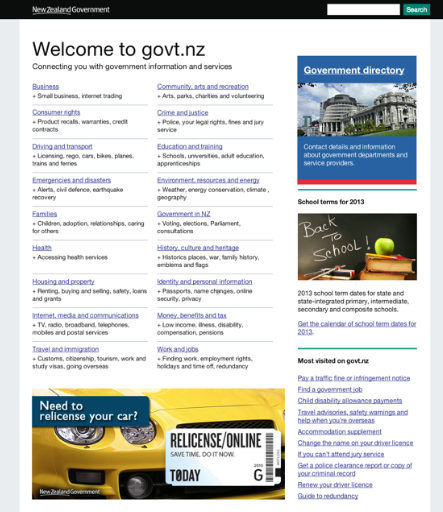 The NZ team have also scoured our blog, the Government Digital Strategy, the Government Service Design Manual, and any other bits of guidance we could provide. They’ve researched the strategies behind government sites around the world, and GDS gets a special mention on their preview site. The most obvious GOV.UK influence is on the design - and with GDS’s policy of coding in the open they were able to use our front-end code. Recycling our work has enabled them to save huge amounts of time, and a considerable amount of money. Initial user research revealed that 70% of people like the design or have a neutral opinion, which is a great result for a new release. We're looking forward to sharing more work and user-feedback in the future, so we can improve sites for citizens in New Zealand and in Britain. What's the best place to start at if I want use Gov.uk's front-end code as well. I know about https://github.com/alphagov but there are so many projects on it I honestly don't know where to start. But do you have information on your editorial process and tools? Hi Pieter. Good starting points are the following blog posts - Shared asset libraries - http://digital.cabinetoffice.gov.uk/2011/09/19/introducing-the-needotron-working-out-the-shape-of-the-product/, and Introducing the Needotron - http://digital.cabinetoffice.gov.uk/2011/09/19/introducing-the-needotron-working-out-the-shape-of-the-product/. Did you ever get it working locally? I've been try to run/demo the whitehall rails app but I keep getting 'Net::HTTPForbidden:' error. Great example of the benefits of international cooperation on the 'little' things as well as on high profile policies. Having worked for both the NZ and UK governments this is a really good move - NZ govt sites are currently in a similar place to where UK govt sites were pre-GOV.UK (i.e., of variable quality, uncoordinated/duplicative, difficult to search). Moving to a single site using a tried-and-tested design/methodology is a good step forward.